At both the IAA in 2012 and this year’s Busworld, there was significant evidence that full electric bus operations are seen by many as the way forward for urban operation so the opportunity to attend this year’s Elektromobilitaet (electric mobility) conference in Dresden was not to be missed. Around 250 participants filled the room at Dresden’s Conference Centre for the two day event organised by SAENA, the energy agency for the German state of Sachsen. The conference featured 17 presentations across three main themes: innovations in Sachsen itself, key technology for electric buses and current electric bus operations. Whilst matters relating to funding were likely to be of specific German interest, operational experience and technical detail know no boundaries and, as expected, provided significant food for thought. Dr Veit Steinle from the German Ministry of Transport, Construction and Urban Development opened with an overview from a German perspective. Electric mobility was a key objective in supporting climate change targets and ensuring long term mobility. Germany intended to be a leading market for and producer of electric mobility systems including battery and hydrogen fuel cell technologies. The current focus was on research, development and demonstration with the longer term objective of one million electric vehicles in use in 2020. Dr Steinle described the organisation of the ‘National Plattform Elektromobilitaet’ established in 2010 to co-ordinate development projects across the electric mobility field from design and development to training and end of life recycling. The German development model includes the concept of model regions, ‘schaufenster’ (showcase) and ‘leuchtturm’ (beacon) projects chosen in open competition together with a commitment to the staged conversion of the government’s own vehicle fleet to electric propulsion. In terms of public transport, 20 projects were planned involving 24 bus operators, focusing on the further development of hybrid and electric vehicles and their associated charging systems. These will introduce 106 hybrid, 12 full electric and seven fuel cell vehicles across the model regions in addition to the further development of vehicles placed in service between 2009 and 2011. Dr Steinle closed with an overview of the eleven criteria under which the projects would be evaluated including operational, environmental, economic and public acceptance aspects. The latter was of particular interest with potential conflict from policies such as the ability of electric vehicles to use bus lanes, of minor interest at present but potentially a hindrance to public transport as Germany moved towards one million electric vehicles. Taking the overview a stage further, Cathleen Kloetzing of conference organisers SAENA GmbH presented the current state of electric mobility projects in Sachsen which was a model region for public transport, energy storage and vehicle trials. 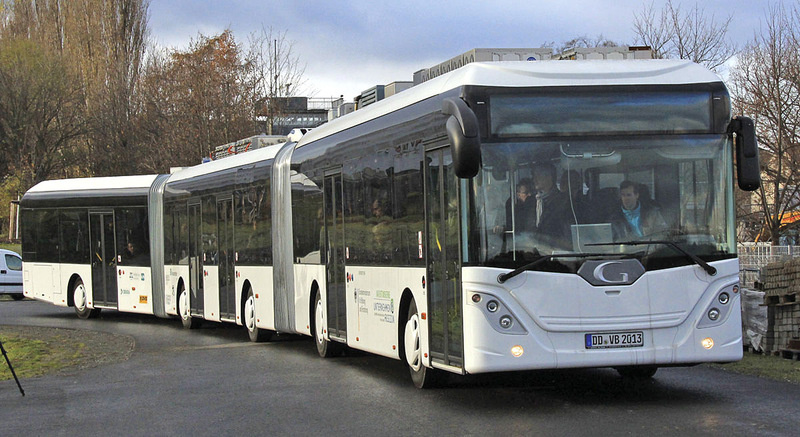 The initial SaxHybrid project encompassed serial hybrid articulated vehicles from Hess and Daimler, delivered in 2011 to the transport operators in Dresden and Leipzig for extensive in-service testing as the first step towards the objective of full electric fast recharge operation. Cathleen made it clear that it was not just a case of buying hybrids. SaxHybridplus is the next stage of the project, introducing ‘plug-in’ recharging together with intuitive energy management systems, on street recharging systems and the development of lightweight vehicle construction systems to balance the increased weight of onboard systems. Vossloh-Kiepe, Lex&Hesse and The Fraunhofer Institute are partners in the project with the Dresden and Leipzig transport operators. SAENA are also supporting the four full electric bus projects being developed in Leipzig and Dresden and the development of modular energy storage systems by Hoppeke as well as car and rail based projects. So what was this investment delivering? There followed two open presentations from an operator’s perspective given by senior managers in the Leipzig and Dresden transport operations. Ronald Juhrs, Technical Director of LVB in Leipzig spoke of the opportunities and risks presented by the introduction of a hybrid fleet and the need for those involved to ensure they recognise the developmental nature of the project. 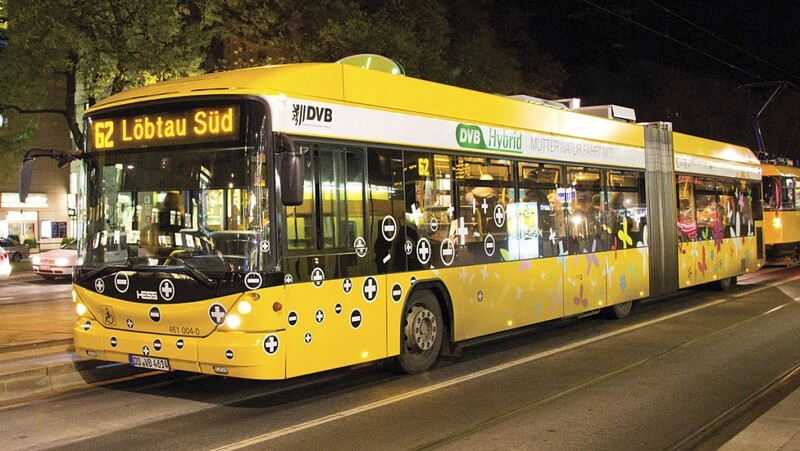 LVB and its subsidiary LeoBus GmbH has a fleet of 19 hybrids, a single first generation Solaris parallel hybrid delivered in 2007 and 18 vehicles from Hess, Daimler and MAN delivered as part of the SaxHybrid and RegioHybrid projects in 2011. The results from the hybrids were not as good as expected with some of the latest deliveries of diesel vehicles delivering almost as good fuel consumption figures whilst availability was around 10% below that of the diesel fleet at 80%. Despite this, Ronald Juhrs saw the project as very positive in building cooperation across the industry for future developments. LVB recognised that there were specific training requirements for their electric powered vehicles, both trams and hybrid buses. These were being addressed with the adoption of ‘actuate’ an eco-driving training and motivation campaign. Moving on to projects in development, Ronald Juhrs presented ‘Batterfly’ and ‘Skorpion’. In issue 1197 (26 October 2012) Bus and Coach Buyer reported on the demonstration of a Solaris electric bus in Markkleeberg, a town just south of Leipzig and the potential for an electric bus network in the area feeding the newly launched ‘SBahn Mitteldeutschland’ suburban electric rail system. This has now progressed into project ‘Batterfly’ to be delivered in the period 2013 to 2015 where two battery powered midibuses will operate a route resembling the partial outline of a butterfly, recharged at a stopping point on the route at which regenerated power from LVB’s tramway network is available. ‘Skorpion’ is also intended to serve Markkleeberg, potentially replacing in part the current tram route and using its electric infrastructure to feed fast recharging en route for articulated electric buses. The proposal follows LVB’s involvement in the EU ‘Trolley’ project where LVB, the only non current trolleybus operator to participate, were considering converting an existing bus route to trolleybus operation. ‘Skorpion’ will use automatic poling/depoling systems to stretches of twin wire overhead, automatically switchable in polarity to recognise the vehicle’s direction of travel, thus minimising the amount of overhead equipment required. Funding challenges, particularly for the basic vehicle, have still to be resolved to allow delivery of the project by 2016. 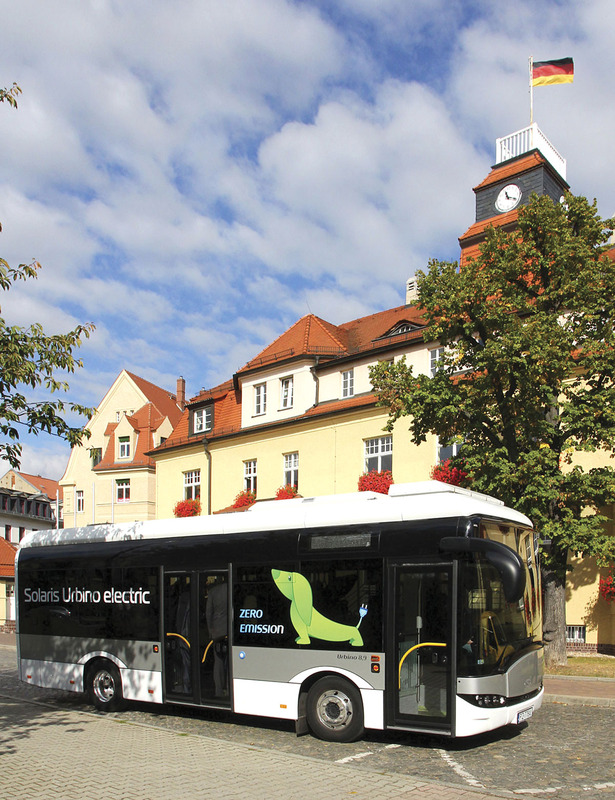 Seventy miles away in Dresden, similar hybrid trials have been undertaken by DVB and two electric bus projects are also planned. Reiner Zieschank, a member of the board of DVB and Director of DREWAG Stadtwerke Dresden GmbH presented an alternative approach from an energy supplier’s perspective. He was particularly concerned about the over focus on investment in developing renewable electric energy systems which still needed power station and network capacity to cover their unpredictability and urged a greater focus on the energy used for heating and transport. Dresden operated regenerative fossil fuel power stations delivering power and district heating at nearly 90% efficiency with around two thirds of the city’s public transport electrically powered. He questioned whether the electric car was the solution for cities and especially the costs of providing in city recharging points. To break even, these each needed to be used by some 800 vehicles per year whereas the current annual usage averaged twelve vehicles per point. Turning to DVB’s operations, he described two showcase projects under development. ‘Line 79’ is a suburban route for which an electric midibus with a single overhead charging point fed from the tram system was being sourced for operation by 2015. ‘Pilot route 64’ will include the further development and proving of hybrid technology as the precursor to full electric operation, including specific heating/cooling systems and lightweight wheels. Savings of 25kg per wheel were mentioned. Recognising the need to improve on the performance of hybrid vehicles, Dr Thoralf Knote presented the recently launched SaxHybridplus project, moving towards plug-in operation with intuitive energy management systems. The project was intended to address the key issues of vehicle weight due to on board energy storage, insufficient on board energy storage, inflexibility in adaption to a route’s characteristics and the desire for longer periods of pure electric operation. 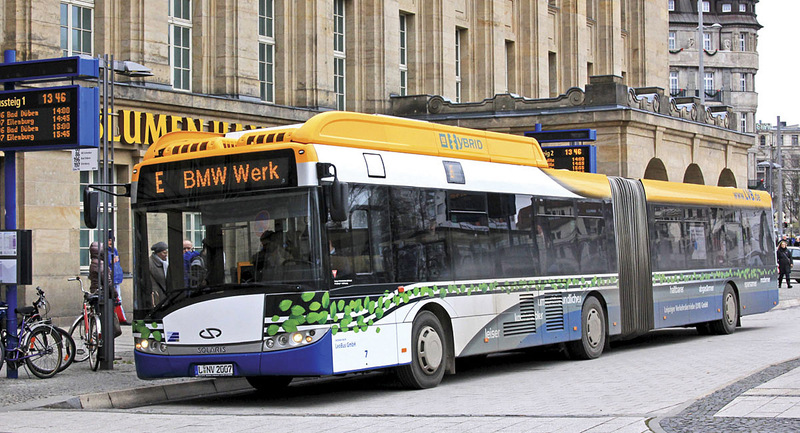 In Dresden, there was a particular problem caused by the hilly nature of the routes served, the storage was insufficient to capture the energy regenerated during breaking, resulting in increased diesel consumption. One solution to this issue is to develop a specific route based programme to ensure that the energy storage is empty before a downhill stretch of route. The programme would then need adapting to match each vehicle’s individual characteristics hence the potential benefits for an intuitive system. Whilst retaining the potential for normal serial hybrid operation, all aspects of the vehicle’s weight will be reviewed and componentry for plug-in hybrid operation developed alongside the intuitive energy management system. Testing will be undertaken in Leipzig and Dresden with their significantly different topographies; the steepest hills in Leipzig are onto railway bridges! The first session of the conference was completed with a presentation entitled ‘People and Technology’ by Christine Schwaerzel of consultants VerkehrsConsult Dresden-Berlin. 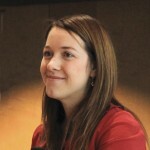 Christine described her company’s involvement in many of the projects already referred to before going in to some detail on their project management role. Two particular points to emerge were the need to define the exact start and finish of a project and the early engagement with media to positively promote and minimise the risk of negative publicity for the project. She advised that projects should include a communications plan for all stakeholders with strategies to manage positive and negative influences both to and from the project team.